DiscOlaf: Since 1984 - Parties, Celebrations, Festivities. Portrait. Travel may broaden your mind. But staying can do the same. For fourteen years now DiscOlaf has been hotting up the Tivoli Ice-Rink in Aachen with your hand-picked music beats. DiscOlaf is the pen name of the lively presenter Olaf Konstantin Krueger - respected professional, freelance journalist, member of the German Disc-Jockey Organisation (DDO), and a radio presenter who was with the Belgian private radio station 'Radio Contact' in Eupen for many years. Olaf has been a member of the German Journalist Association (DJV) since 1989 and an official of the Aachen Press District Association (B.A.P.) since 1996. In 1998 and 1999, Olaf was the DJV Journalists' Representative in the Organisers' Community (VG) of Local Radio in the Registered Society of the own district-administered town of Aachen/RADIO AACHEN - 100,eins. At present, Olaf is the Journalists' Representative in the Organisers' Community 'Aktuelle Kreiswelle Aachen e. V.'. Moving about in the Aachen Tivoli Ice-Rink in 1989 and 1992: the presenter going from the caretaker's room on the ice to its perimeter barriers. Olaf first appeared as DiscOlaf in 1984 at the school-leaving party of the grammar school 'Kaiser Karl' in Aachen. Olaf's military service in Lüneburg followed. In 1987 and 1988 DiscOlaf made a name for himself as administrator of No-Drinks-Discos offered by the German health insurance institution 'Allgemeine Ortskrankenkasse'. Popular with the party-goers, the No-Drinks-Discos met with a favourable reaction in the press. Olaf went up to study politics, economic geography and geography at Aachen University of Technology, first DiscOlafing at the Tivoli Ice-Rink in the 1988/1989 season. Olaf has been performing there ever since. With its bar 'Pinguin', its youth meeting-place 'Kids-Treff', its restaurant 'Zum Eisblick', its squash courts, its big car park and its sale of sports equipment, the Tivoli Ice-Rink is more than a simple sports complex. Above all it is a place where young and old come together. Olaf also wrote various articles about the Euregio in the local newspaper 'Aachener Volkszeitung'. Ice sports is generally thought to be characterized by the gracefulness of figure skating as well as by the toughness of ice hockey. At the Tivoli Ice-Rink in Aachen ice-skaters from all disciplines and age-groups can be seen during general opening hours. From day one DiscOlaf has been contributing towards the 'Super Ice-Skating-Disco with Great Raffle' on Saturdays. This event is a major success with the public, particularly with the 11 to 19 year olds, and among these, especially with those teens unable to get into discos because of their young age. Other regulars of the 'Super Ice-Skating-Disco' are students, families and youth clubs. At the centre of the musical program are hits. The music is based on the official German sales charts as presented by Media Control's Single Top 100, modified however by the tastes of the ice-skating crowds coming from across the Euregio. 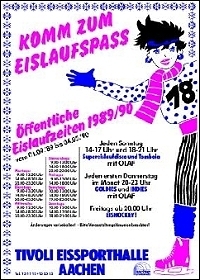 1989 poster for the 1989/1990 ice-skating season displaying the dates of DiscOlaf's Super Ice-Skating-Disco with Raffle and DiscOlaf's Oldies' Disco. © 1988–2009 Dr. Olaf Konstantin Krueger, M.A. | All rights reserved. Conditions Of Use. Im Bild: Nadine und Sascha. Im Bild: Anja, Iris und Sabrina.